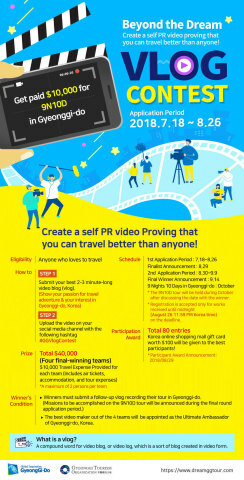 Gyeonggi Provincial Government and Gyeonggi Tourism Organization (GTO) are hosting an international video contest called “Beyond the Dream VLOG Contest 2018.” Video submissions will be accepted until August 26, 2018 (Korean Standard Time). The goal of the “Beyond the Dream VLOG Contest 2018” is to raise global awareness of Gyeonggi Province as an attractive travel destination and to select a Gyeonggi-do tourism ambassador who will show the world the charms of the province. Anyone who likes to participate can submit a 2-3 minute self-PR video that explains how you can travel Gyeonggi-do better than anyone and upload them on their personal social media such as YouTube, Instagram or Facebook with hashtags #GGVlogContest. Submitted video and script files should be also attached to the online application form on the website of the contest (www.dreamggtour.com). The contest is opened for everyone regardless of nationality and age. A maximum of two persons can be in one team. A total of 80 entries will qualify for the final round. Final-round contestants should submit their itineraries to tour Gyeonggi-do for 10 days and 9 nights. The plans will be rated by judges who will select final four winners. Final winners will be announced on September 14. Each of the four final-winning teams will earn $10,000 in expenses for Gyeonggi-do tour, including air tickets, accommodation, and tour expenses. All they have to do is to tour the province in October according to their plans and submit their tour videos afterwards. The contestant who produces the best tour video will be appointed a tourism ambassador of Gyeonggi-do. You can enter Beyond the Dream VLOG Contest 2018 on its website (www.dreamggtour.com). Details such as the contest schedule, participation procedures and related events will be available through the official SNS channels of Gyeonggi Tourism Organization during the contest period.